How to calculate hipped/gabled roofs from outline coordinates? For my new project I ideally need to be able to create simple hipped, gabled, and pointed from any arbitrary shape given (by JSON). Pointed and dome roofs are easy enough since the shape just converges to one point upwards, but I can't figure out gabled and hipped roofs just yet.. See attachment for a visual. Does anyone have any idea how to do this? The input would be an array of (clockwise) Vector2's describing the outline of the building. you will need to use a pitch adjustment chart like...the one i posted was junk...I will find a good one when i get home. This is the correct sheet. Interesting problem. If the input must be the roof/gutter outline, then the first question would be how to (automatically) determine which edges are to be gabled and which are not. Similarly, if we look at your example outline, how would we determine that the "large rectangle" is indeed to be treated as one roof section. 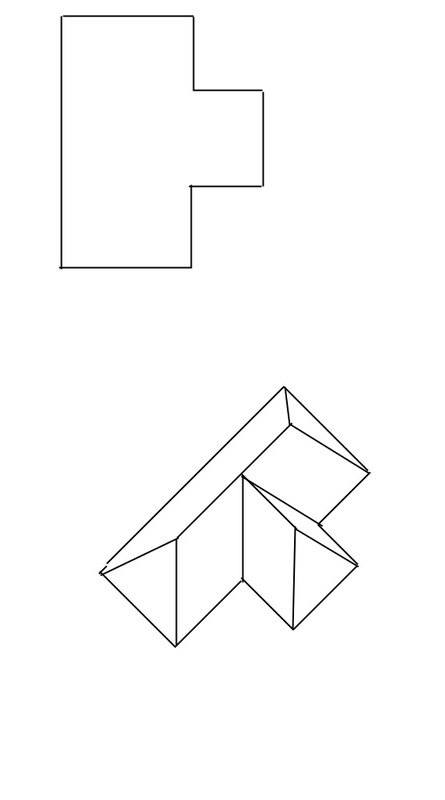 It might be better (if possible) to use separate overlapping rectangles to specify roof sections, rather than an arbitrary compound outline shape, although that might be just moving the problems elsewhere. I'd be tempted to look at some of those 3D home design software packages (e.g. the source code for the open-source Sweet Home 3D http://www.sweethome3d.com/) to see how they handle it (if they even can). Have done it for the shape given but it requires the individual calculation of roof points depending on building outline and a custom mesh. As others have said more difficult to produce a function to deal with building shape. Have done it for the shape given but it requires the individual calculation of roof points depending on building outline﻿ and a custom mesh. Have any idea about building the roof for given different shapes (building shapes)? Sub-divide your extruded "roof" mesh (or add additional vertices at mid-point or other positions) and translate the additional vertices along the positive y axis. You'll be able to create far more interesting shapes this way. All I did was to look at the roof diagram that Convergence provided, calculate the vertices from the diagram, divide into triangular facets and create a custom mesh. So starting from roof 'footprint' sketch out your roof and do the same. However, either approach will provide you with the result you desire. If you can, please give me further explanation cuz I'm very new to this. Also just work through the PG to see how coordinates are arrived at. I tried your code above.When I play the scene, the roof is created. But when I rotate, some parts of the roof are dissapearing. I am busy for a few of days. Have a read of http://doc.babylonjs.com/babylon101/first as it is much easier for someone to work with a playground. Could be the end of the week before I have time to try out your HTML file. Each roof plane can be described using the corner and apex labels. The planes should be draw so that they are described with either 3 or 4 labels. Each plane is set as an array using the labels in a counter clockwise order with corner labels coming first. Remember that the corner labels are already in counter clockwise order. To change an existing playground just edit and save, the playground number will just increase to the next available number, real easy. @JohnK What about planes that have labels more than 4? Below is the roofprint that I'm trying. One plane has 6 labels so it's not creating . Add an extra corner (even though it will not be a real corner) on the top edge and split into two planes. Actually I didn't get it. Can you please explain bit more? Please remember that the Gamelets are demonstrations of what is possible with Babylon.js and how different idea can be achieved. They are starting points not a finished product. You need a line that extends one of the existing lines onto the roof edge to split the plane with five sides.